Compact & screenless comprising of the front camera that has wide viewing angle of 120° at 2MP and 110° with 1MP. Both cameras record 1080P HD video. Format-Free Technology based SD card that enables all data files that are stored will be same in size and there will be no data fragmentation whatsoever. It is hassle-free and very convenient. G-sensor functions as an accelerometer where it observes acceleration of the car when the user is driving and is capable to distinguish gravitational changes. Park Monitoring with Smart Motion function to act when the car is not in motion. The BP10 will be active but there will be no files saved in the memory card. Smart motion is when there is external activity such as movement or vibration, recording takes place with 28.4MB for 28 seconds. Battery voltage level setting is present to stop the device from recording whenever the car battery is low, this will indirectly help to prevent battery drainage. Wireless Control App is available in Play Store and Apple App for free. This app enables the user to view the videos on playback list (VOD), download, live view & change setting with no interference when Wi-Fi connection between the smartphone and DVR is established. 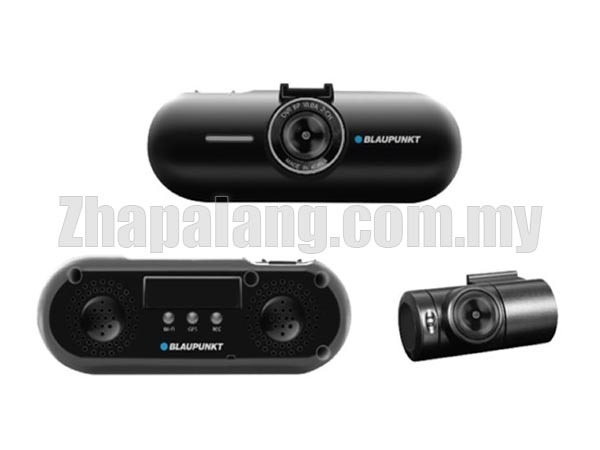 Blaupunkt Digital Video Recorder BP 10.0 A/AG is designed through German engineering to be able to adapt to latest technological rise in terms of safety measure for car drivers when on the road. With mind-blowing Korean Technology, the BP 10.0 is featured as screenless dashcam. There is no LCD display screen equiped with this device as it reduces the distraction faced by the drivers while driving and enhances the viewing angle of the road ahead for car drivers.